September | 2013 | Woxford Brewing Co.
Last brew session I completed my first 100% Brett Beer, a Belgian IPA. This beer completed very quickly and is already kegged at this point, though I bottled about six 750mL bottles to see how the beer changes over a longer period of time. 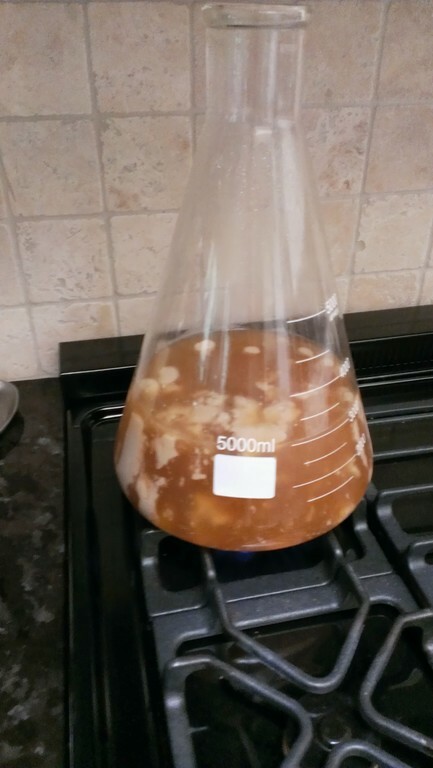 I had initially planned on re-pitching onto the same all-Brett yeast cake, but after the dry-hop of the IPA I decided that a fresh pitch and combining with traditional yeast strain would be more interesting. I’m hoping the normally fruit-forward yeast along with the floral hops in the ESB will work well with the aromas that Brett B. Trois produces. I took my existing Best Bitter recipe that is really nice and bumped up the gravity and bitterness, part of the feedback from submission to a local Pro-Am and then added a touch of oats for mouthfeel as insurance for the Brett’s super-attenuative nature. Did a 1L starter of 1968 24 hours before pitch. Sanitizing wort saved from squeezing the spent grain. 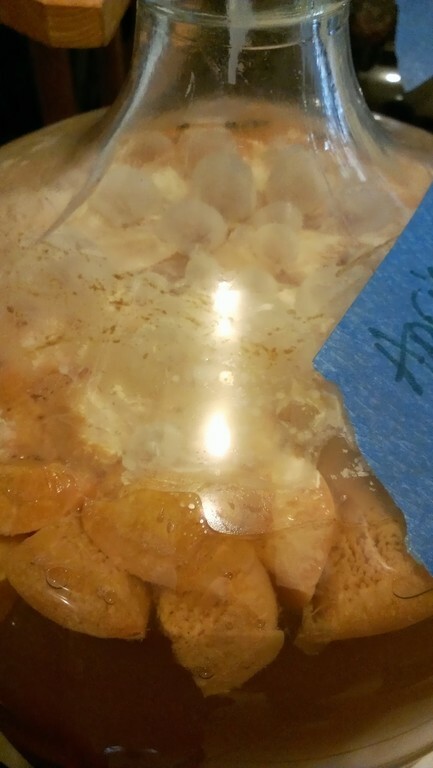 One of the things I’ve learned about working with Brettanomyces and other non-Saccromyces organisms is that they need to be cared for in a different way. For Sacc, I don’t keep any extra or spare yeast around, besides the backup dry-yeast packets for stalled or failed fermentations. 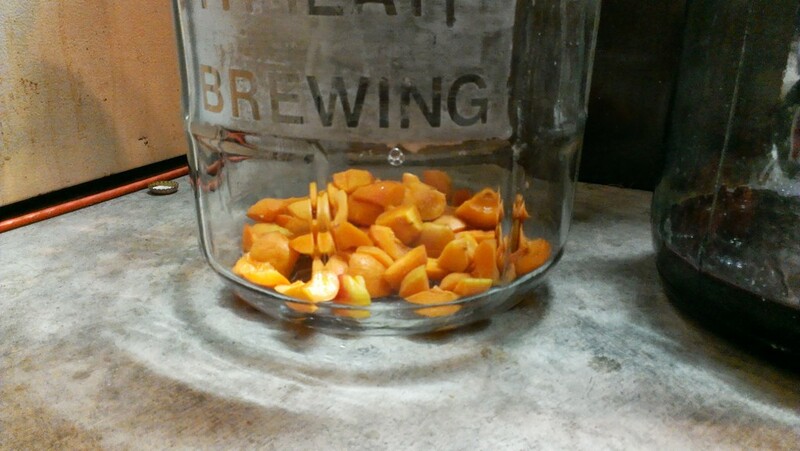 However, since finding Brett and Brett blends that taste good is difficult, many times homebrewers are stepping up yeast from bottle dregs and want to hang on to them for a while. 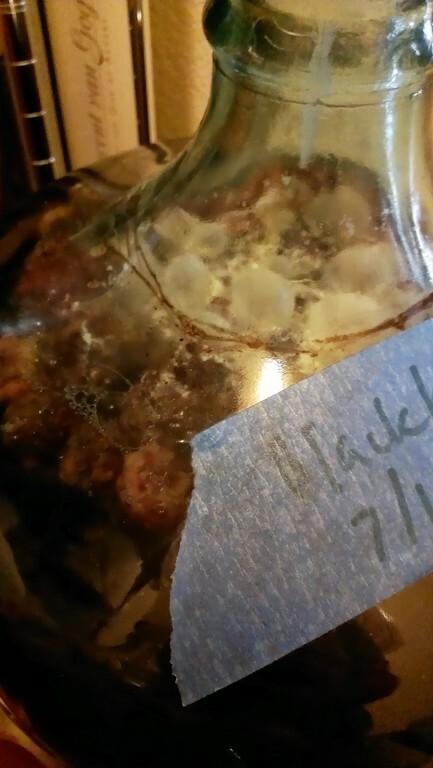 My first reading on how to keep Brett and other bugs going was from The Mad Fermentationists. I picked up four 1-gallon jugs and air locks. I’m using unfiltered pure apple juice to feed the Lactobacillus, and then some simple Dry Malt Extract (DME) based starters for Brett and Pediococcus. 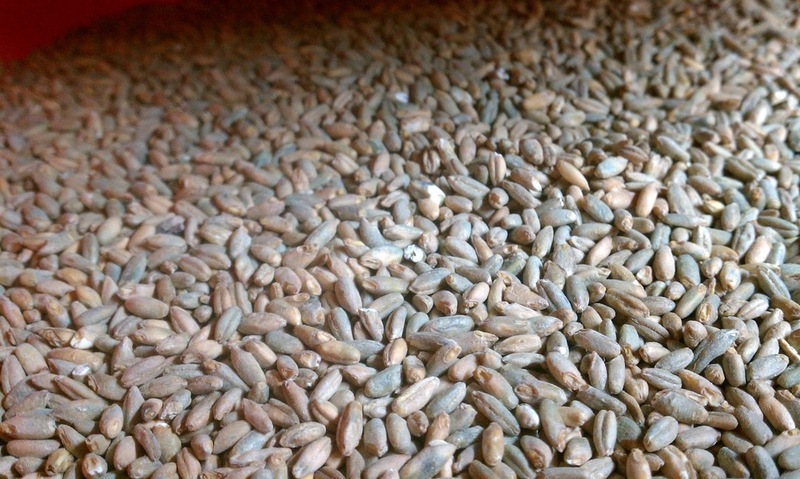 DME is fairly inexpensive, but it certainly takes time to prepare and cool a batch for keeping the organisms happy. The Mad Fermentationist’s mentions to decant and feed the bugs every month or so. It occurred to me that I’m already making a batch of wort that I could use. I brew roughly every two weeks and part of my process involves moving the spent grain into a bucket lined with a nylon bag. I used to do brew-in-the-bag method, but with the Blichmann false bottom, I no longer need to worry about having a bag big enough, nor a winch to lift such a bag. The remaining benefit to the bag usages was to remove excess wort and moister from the grain to prevent one of the most potent and foul aspects of brewing from occurring: rotten grain. 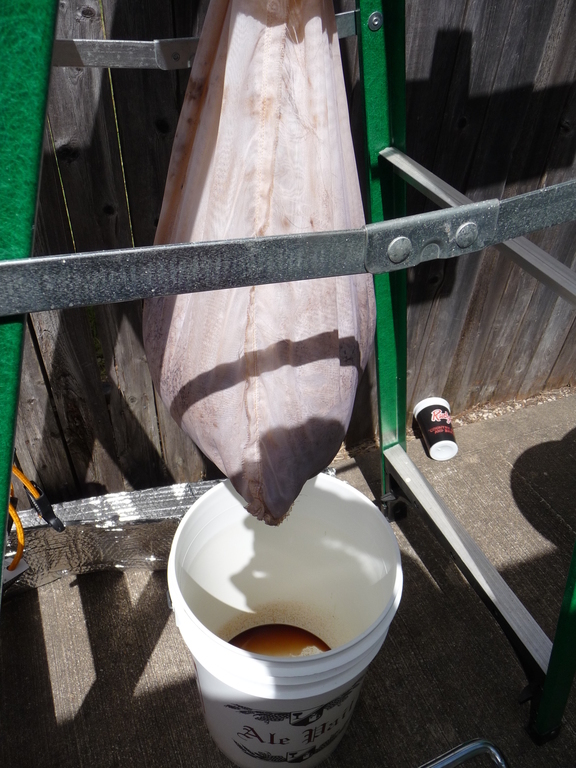 Grain bag holding spent wort, draining into a bucket for re-use. It was a Friday night after one of my first brews on the new system and I had poured the spent grain into no less than three layers of garbage bags and tossed the old, wet, grain into the trash can. Our garbage collection service stops by on Tuesday morning. I spent quite a while in the garage on Sunday morning trying to find whatever dead animal that crawled in and died. I soon discovered that the offensive odor was coming from the bag of rotten grain. It took more than a few days to be rid of that awful smell. Lesson learned. Thus every brew night I let the grain in the bag cool down after squeezing a gallon or more of wort out of the bag. Sometimes I use the extra wort to bring up my batch to the target volume, but at this point I’ve got my system dialed in. That means I’m just throwing the wort onto the grass. Well, no more my friend. I saved off the extra wort in one of the gallon jars and I was just about to split it up to pitch the bugs into it when I realized that it hadn’t been boiled and was teeming with lots of bugs from the grain. A quick boil on the stove and a chill in the sink and I was done. I’m completely happy with this method for not wasting wort as well as keeping my new collection of yeast and bacteria well fed. 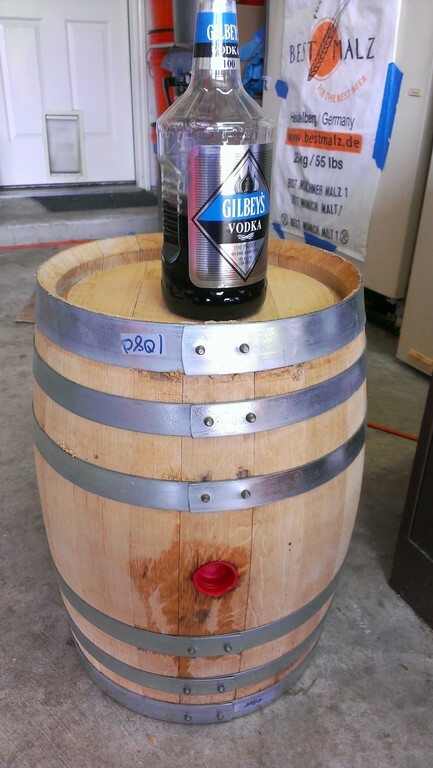 About a month ago I added my second beer to the Whiskey barrel, a Strong Scotch Ale. I initially figured that this second beer would take twice as long to pick up the whiskey character. My first surprise was the amount of whiskey flavor in the holding solution, vodka. A whole bottle of vodka went in clear, half a bottle came out smelling and looking like whiskey. I took my first sample at two weeks and the whiskey component was quite evident. 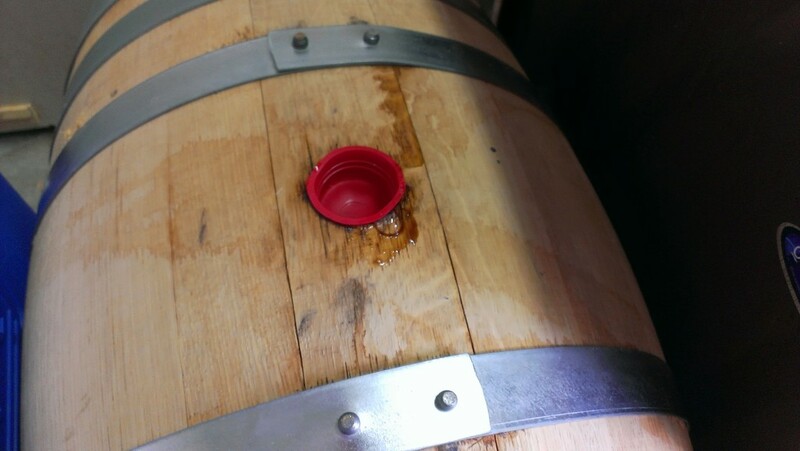 Before I decided to empty the barrel though I wanted a second and third opinion. Last weeks brew night I pulled another sample and passed that around. Everyone could pick up the whiskey immediately. After that it was a mixed response. One commented that there wasn’t much of the Scotch Ale maltiness present. Another asked for more whiskey. That may just mean that it’s just right. As with the last batch, I’ll keg half of the beer and bottle the other. This time, even though there is likely enough live yeast since we’re only a month in, I’m going to pitch some more yeast along with priming sugar to ensure proper carbonation. My last batch of the Whiskey Russian Imperial Stout has been in bottles almost 3 months now and has very low carbonation. A few months ago, I brewed 10 gallons Berliner Weisse using the sour worting technique. That was my first time attempting to sour mash that much wort and I was testing out new equipment to hold the temperature steady for growth of Lactobacillus. 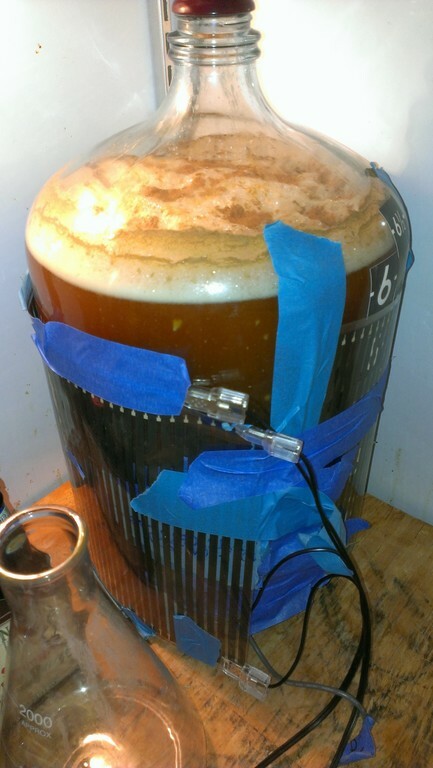 After 12 hours, the temperature had risen to 130F which was rather close to temp needed to kill off the lacto. I went to pick up a few more vials of pure lacto, but the homebrew store was out, so I had to go old-school and pitch multiple handfuls of uncrushed grain which contain Lactobacillus among many other bugs. This was successful in generating an amazingly tart flavor. However, the side-effect was that I also picked up some butyric acid as well which has the lovely aroma of gym feet and old cheese. 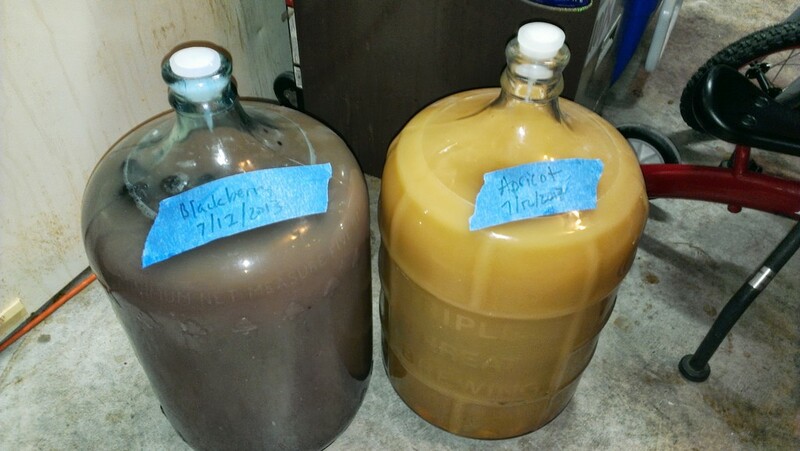 In the hopes that some extra age and fruit might help, I racked the beer into two containers with puree of Apricot and Blackberries, along with some fresh fruit of the same. Two weeks passed and the flavors were really taking shape, picking up lots of the fruit aroma and taste. The foot oder, however, was still quite present. My next thought was to do something I had just heard from a podcast on The Brewing Network. Chad Yacobson of The Brettanomyces Project who know runs Crooked Stave brewery described the process around a no-boil berliner weisse. Chad ended up needing to innoculate the beer with brett and waited over two months to allow the brett to convert the buteyric acid into more lively pineapple and tropical fruit aromas. 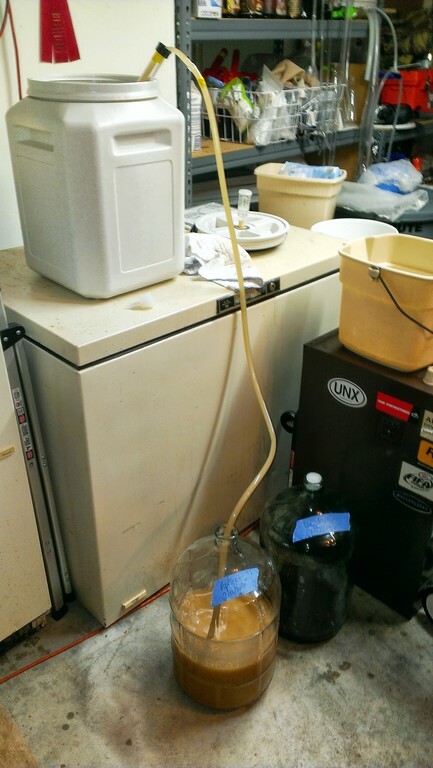 Before I had a chance to step up any pure strain I ended up pitching some bottling dregs from a non-sour Jester King beer, Noble King, as they use Brett Drie for bottling yeast. 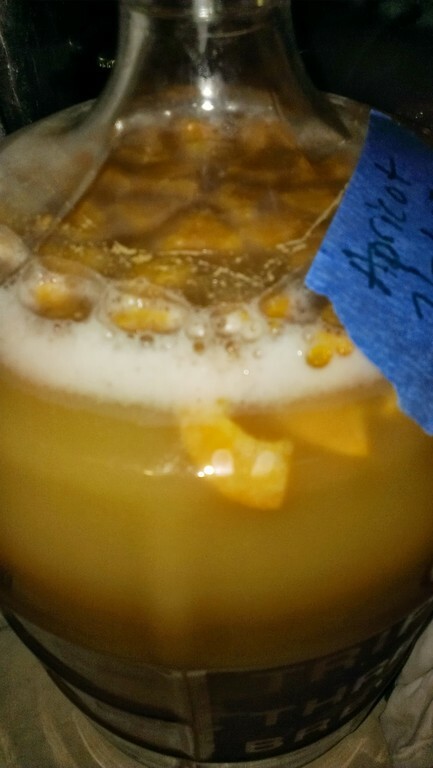 Within two weeks of pitching, we now have a nice pelecile formed on top of the berliner weisse.